Objective: The objective of this study is to evaluate the efficacy and toxicity reduction of Shenqi Fuzheng injection in the treatment of nonsmall cell lung cancer (NSCLC). Materials and Methods: Through searching the PubMed, WANFANG and CNKI, we recruited clinical trials related to Shenqi Fuzheng combined with radiation in the treatment of NSCLC. We extracted the treatment effective data and radiation related toxicities data. The clinical efficacy and radiation toxicity was pooled by meta-analysis. The statistical heterogeneity was evaluated by I 2 tests. Results: By searching the related databases, we finally included 7 studies in this meta-analysis. 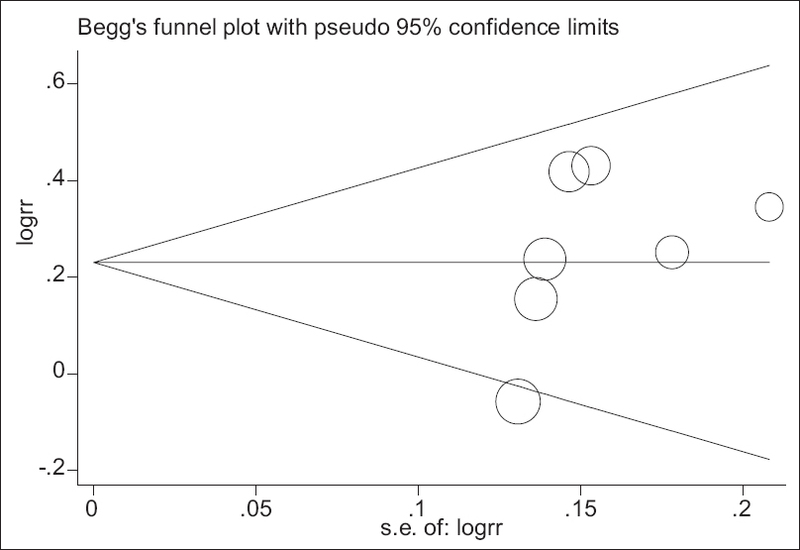 The pooled results indicated that Shenqi Fuzheng injection can improve the clinical efficacy (relative risk [RR] =1.27, 95% confidence interval [CI]: 1.13-1.43), and decrease the radiation pneumonia (RR = 0.41, 95% CI: 0.26-0.46), radiation esophagitis (RR = 0.46, 95% CI: 0.37-0.59) and bone marrow suppression (RR = 0.44, 95% CI: 0.36-0.53). Conclusion: Shenqi Fuzheng injection can improve the clinical efficacy and decrease the radiation toxicities in the NSCLC patients treated with radiation. Huijuan Jiang and Hongzhi Zhang contribute equally to this work. It was reported that approximately 228,000 new cases of lung cancer have been diagnosed in the United States each year and radiotherapy (RT) is needed in over 60% of patients with lung cancer at least once during the course of disease. , The adequate dose is an essential element for the successful treatment of patients with nonsmall cell lung cancer (NSCLC). In general, lung cancer is divided into two subgroups with small cell lung cancer and NSCLC. The NSCLC is accounting for 70-80% all the diagnosed lung cancers. In the course of this disease, about 60% of the patients have received radiation therapy. Radiation is useful for locally control the NSCLC, but the radiation related toxicity is severe and sometime interfere the treatment modality. It was reported traditional medicine Shenqi Fuzheng injection can decrease the radiation toxicity such as radiation pneumonia and radiation esophagitis. In this meta-analysis, we included all the published articles about Shenqi Fuzheng injection adjuvant treatment of NSCLC, who received radiation. Clinical studies, published before March 2015, of RT for NSCLC patients with or without administration of Shenqi Fuzheng injection, were identified from the PubMed, WANFANG and CNKI databases through an electronic sensitive search. We use the following terms for search: "NSCLC," "NSCLC of the lung," "NSCLC," "Shenqi Fuzheng." The search procedure was carried out by two reviewers independent. The studies were limited to human trials, with the language restriction of English and Chinese. All references of relevant articles were scanned for additional analysis. All of the data for each individual data were extracted by two reviewers independently. If meeting disagreement, a third reviewer was consulted for consensus. The following information and data were extracted from each study: First author's name, year for publication, the number of patients in the experiment and control groups, stages, radiation regimens, and Shenqi Fuzheng dosage. The data for pooling was also extracted: Response rate, the number of patients developed radiation pneumonia, radiation esophagitis and bone marrow suppression. We use the Tata11.0 software (http://www.stata.com; Stata Corporation, College Station, TX, U.S.) to do all the statistical analysis. The efficacy and radiation toxicity was expressed by relative risk (RR) and its 95% confidence interval (CI). The statistical heterogeneity was assessed by Chi-square (χ2 ) test. By searching the PubMed, WANFANG and CNKI, databases, we finally included seven studies with 256 and 261 subjects in the experiment and control groups, respectively in this meta-analysis. All of the included trails are come from China and published in Chinese. None of them report the blindness, allocation methods and intention to treat, so the quality was poor for the included seven papers. The radiation dosage range from 60 to 70 Gy. All of the patients received Shenqi Fuzheng injection 250 ml, qd for 6-8 weeks. The general characteristics of the included seven studies are shown in [Table 1]. Seven studies reported the clinical efficacy improvement. Moreover, no statistical heterogeneity was found between the studies. The data were pooled by fixed effects model. The pooled data showed that Shenqi Fuzheng injection can improve the clinical efficacy in NSCLC patients treated with radiation (RR = 1.27, 95% CI: 1.13-1.43) [Figure 1]. 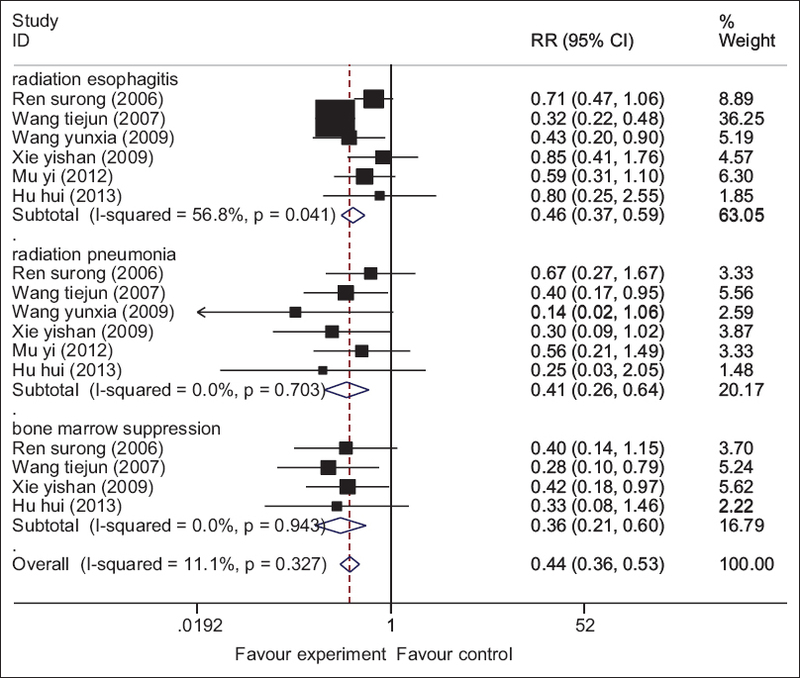 Six studies report the radiation toxicity and pooled results indicated that Shenqi Fuzheng can decrease the radiation pneumonia (RR = 0.41, 95% CI: 0.26-0.46) [Figure 2], radiation esophagitis (RR = 0.46, 95% CI: 0.37-0.59), and bone marrow suppression (RR = 0.44, 95% CI: 0.36-0.53) [Figure 3]. 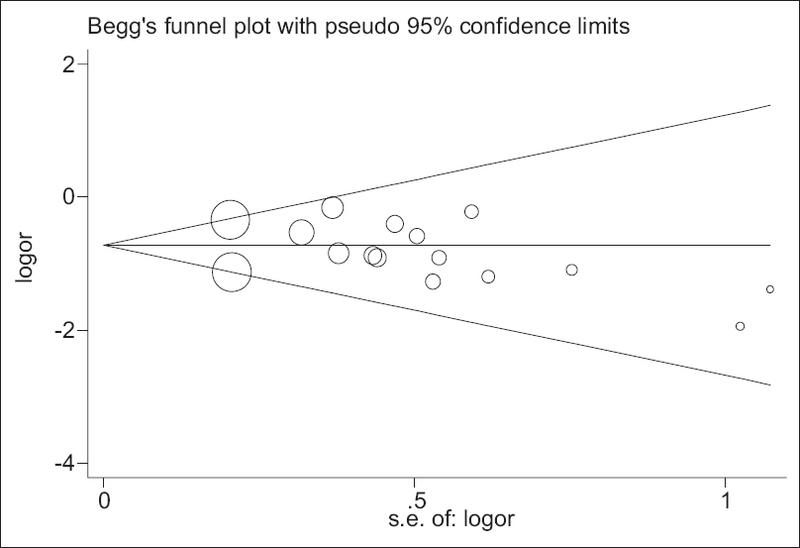 We use Begg's funnel plot and Egger's line regression test to evaluate the publication bias. 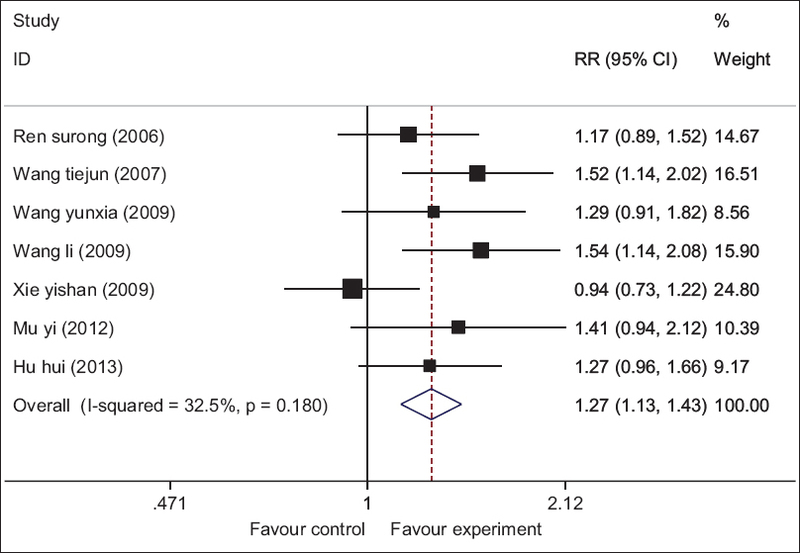 We found no significant publication bias was existed in this meta-analysis [Figure 3] and [Figure 4]. In this meta-analysis, seven articles related to the Shenqi Fuzheng injection adjuvant treatment of NSCLC were with 256 and 261 NSCLC patients in the experiment and control group, respectively. The pooled results indicated that Sheqi Fuzheng injection can improve the clinical efficacy and decrease the radiation toxicities in the NSCLC patients treated with radiation. However, this meta-analysis has several limitations including low quality of each individual study, a small number of cases in each study, language restriction, and a small number of studies included in. Hence the conclusion should be interpreted cautiously. Shandong province natural science foundation of China (ZR2011HL028). Zheng R, Zeng H, Zhang S, Fan Y, Qiao Y, Zhou Q, et al. Lung cancer incidence and mortality in China, 2010. Thorac Cancer 2014;5:330-6. Livingston RB. What is the role of radiation therapy in locally advanced non-small-cell lung cancer? Ann Oncol 1999;10:259-60. Siegel R, DeSantis C, Virgo K, Stein K, Mariotto A, Smith T, et al. Cancer treatment and survivorship statistics, 2012. CA Cancer J Clin 2012;62:220-41. Amini A, Yeh N, Gaspar LE, Kavanagh B, Karam SD. Stereotactic body radiation therapy (SBRT) for lung cancer patients previously treated with conventional radiotherapy: A review. Radiat Oncol 2014;9:210. Hui H. Clinical effect of shenqifuzheng injection combined with 3DCRT in the treatment of advanced non-small cell lung cancer. Pract Pharm Clin Remedies 2013;16:1133-5. Surong R, Dongbiao L, Youqiu Z, Jin W. Shenqifuzheng injection combined with radiation in the treatment of elderly patients with non-small cell lung cancer. Chin J Integr Tradit West Med 2006;16:41-43. Tiejun W, Ying J, Hongyong W, Zhefeng Z. The observation of therapeutic efficacy of shenqifuzheng injection combined with radiotherapy in treating limited and advanced non -small cell lung cancer. J Mod Oncol 2007;15:1672-4. Yunxia W, Shumei Z, Huimin F, Rong H, Yu L, Xinrong X. Shenqi fuzheng injection combined with three dimensional-conformal radiotherapy for old patient′s advanced non-small cell lung cancer. Chongqing Med 2009;38:460-1. Yishan X, Yijiao Z, Rui W. Shenqifuzheng injection combined with 3-dimenation conformal radiotherapy for 46 cases of advanced non-small cell lung cancer. Guiding J Tradit Chin Med Pharm 2009;28:1290-2. Li W. Shenqifuzheng injection combined with radiotherapy in the treatment of non-small cell lung cancer: Report of 49 cases. Chin J Ethnomed Ethnopharmacy 2009;18:136-7. Yi M, Youmin R, Jin Z. A clinical observation of shenqifuzheng injection in the treatment of advance non-small cell lung cancer: Reporting of 35 cases. Guiding J Tradit Chin Med Pharm 2012;10:39-40. Vijayakumar S, Shepard K, Thomas F, Weick J, Rice T, Mehta A. Role of radiation therapy in small cell lung cancer: A bio-clinico-pathological review and perspective. J Natl Med Assoc 1987;79:496-504. Ai Q, Zhang W, Xie Y, Huang W, Liang H, Cao H. Post-marketing safety monitoring of shenqifuzheng injection: A solution made of dangshen (Radix Codonopsis) and huangqi (Radix Astragali Mongolici). J Tradit Chin Med 2014;34:498-503.